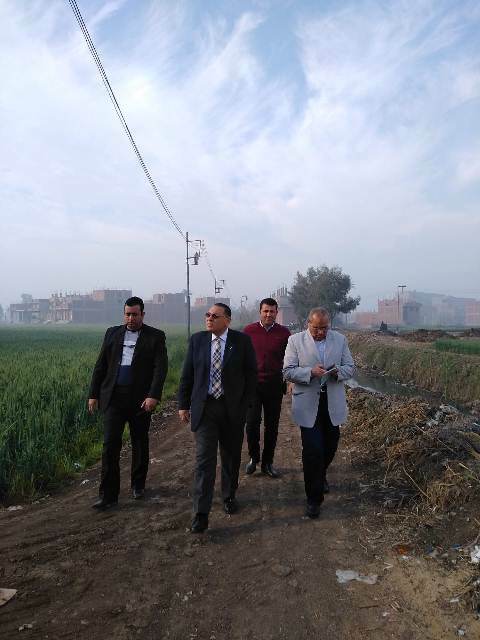 Dr. Mamdouh Ghorab, Governor of Al Sharkia, ordered to stop and remove the buildings erected by the violation on the agricultural land in Azbat Al Beih of Mashtoul El Souk Center and to take all legal measures against the violators. The governor also decided to refer the officials of the agricultural and engineering departments to be investigated for negligence in work, and not to take legal action against violators, stressing that He will not allow the presence of a negligent official in his work within the executive branch of the province. This came during his surprise tour in Mashtoul El Souk in response to complaints of citizens received through August, regarding violation of building on agricultural land. The governor issued strict instructions to the heads of centers, cities and neighborhoods to form committees to pass on agricultural land to maintain them and to address the work of building violation and take legal action against violators. Also, Governor of Al- Sharkia inspected the Agricultural Cooperative association and inspected Mashtoul Central Hospital to see the health and treatment services provided to patients. The governor toured reception, emergency, internal medicine, gynecology, obstetrics and pharmacy departments. He also emphasized the need for medicines and medical supplies inside the hospital to be provided 24/7. He also briefed the shifts records to ensure that physicians and nursing staff were present.